Well, the little prince also is experienced as little emperor. This can lead to the impression that the world around this little child or grandchild hast to suffer a lot. And there will be lots of examples which will support this impression. 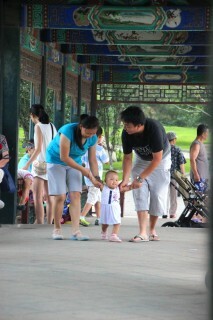 Let me introduce also another perspective to look on the child in the one-child-family with four grandparents. Everybody looks on the child, after the child, with the child. The child is aware of this attention. The child will love it but cannot leave it. It is just …………..like a twenty-four hour controlled relationship. It`s the non-chosen life of the little child. This often leads to a high-developed sensory awareness in the child. With the consequence that the child too often, too early and too clear experiences what the others expect from him or her. Though the child can’t really choose what to do, how to behave and which role to pick up, the situation remains to be controlled, 24 hours a day, seven days a week. Though the child tries to pick up roles, hoping that the others will be pleased by this behavior and this decision, of course the child will experience more care, more love, more attention, but also more control. On the other hand the child looses more and more contact to his inner world, his own feelings, his own interests and his own needs. He’s too much absorbed by this specific relationship I just explained. Insofar the little emperor is caught in his own prison, in his own empire.